We offer indoor edible plants. We offer seeds for agroforestry. Welcome to Green Barn Farm (formerly known as Green Barn Nursery) which has bred and selected an extensive collection of fruit, nut and berry varieties that can resist bitterly cold Canadian winters down to -40 C. We now have made in Canada genetics that are much better suited to cold climate orchards and Permaculture/Agroforestry food forests. Green Barns fruit trees are unique in that they are "Taylor-made" in our cold clay soils using our own seeds, rootstocks and organic growing methods. 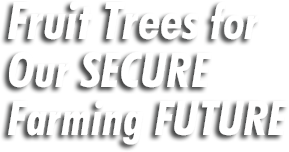 Thus our trees should be better acclimatized to the growing conditions found in the harshest climates in Canada. Green Barn Farm has a PAWPAW orchard and a vineyard with cold hardy seedless table grapes. How? Come and see for yourself on one of our "Taste-n-Talk" tours. We like to share our fruit growing experience (30 years) by giving grafting workshops, seminars, and consultations. Please contact us if you want to organize an event in your area.